Another leftover turkey recipe, this one adds a little sweet and sour to the bird. I love turkey, as most of us do, and turkey leftovers are wonderful. It’s nice to take a break from the regular casserole type turkey leftovers, as good as they are. Sauté vegetables in butter until tender-crisp. Drain pineapple reserving juice. Add water to make up 2 cups liquid. Stir into mixture of sugar and cornstarch until smooth. Add mixture to vegetables with pickle liquid, ketchup and soy sauce. Cook stirring constantly until thickened, about 3 minutes. Add pineapple, turkey, and pickles. Heat through and serve over cooked rice. 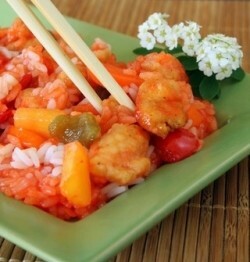 Use fresh or leftover chicken and this becomes a terrific sweet and sour chicken recipe. If you wish you can coat the turkey or chicken pieces with egg then flour and fry them to create a batter as in the image. There are just so many times you want to eat hot turkey sandwiches and casseroles. This recipe for sweet and sour turkey is a nice change. 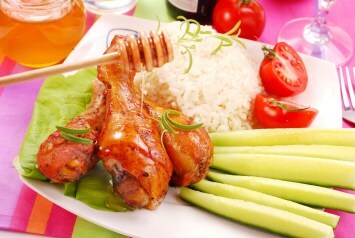 Of course, you can also use this recipe with chicken. Either way, it’s a nice sweet and sour recipe. I think you will enjoy it. You’ll find more of our leftover turkey recipes here. If you like this recipe, I’d love you to Pin it to Pinterest, Tweet about it, Like it on Facebook and add your own recipes for leftovers below.